Are the remaining presales through Ticketmaster? In particular Chicago? I wonder because Ticketmaster doesn't show any info for Mellencamp in Chicago. We have not yet been given the ticketing link by the tour promoter. You could look up what ticketing system the Chicago Theatre normally uses, that ticket link probably won't be up until next Monday. Hi Tony. Any update on Chicago presale? I thought it was in May but it is showing October on the tour page. Thanks! 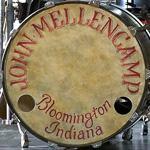 This is what we have in the show detail page and HOME page of Mellencamp.com. We just made the presale the day before the show as the system requires a date. Please note that the public on sale and pre-sale for John's October 25th Chicago Theater show, in Chicago, IL have been delayed until June. We will have updated ticket sale information next week. Just curious -- the presale for the Chicago show is tomorrow, but I haven't received a code. Have they been distributed? Anybody else having problems obtaining pre-sale tickets for Chicago? I have the password, but Ticketmaster isn't showing access to actually buy the tickets. Must be you or your computer. I got some at 1100. I just pulled up Main Floor 4R two minutes ago. Argh! My company firewall screwed me over again. I just had my wife buy our tickets, but 4 hours after they went on sale. I never had the problem with Ticketmaster before.